If Valerian and the City of a Thousand Planets sounds like a pulp sci-fi novel from the 1950s…it sort of is. It’s actually the title of Luc Besson’s latest film, and the director has been making pulp sci-fi with the best of them for years now. With the first teaser trailer set to show this weekend at New York Comic-Con, EuropaCorp has released the first official poster and a few images to whet our appetites. Valerian and the City of a Thousand Planets features Dane DeHaan as Valerian, a special operative for the government of human territories who spends his time maintaining order in the universe and chasing after his fellow operative Laureline (Cara Delevingne). Laureline is unimpressed with Valerian’s womanizing ways, though, and continues to rebuff his advances. Their Commander (Clive Owen) sends the pair on a mission to the intergalactic city of Alpha, home of seventeen million inhabitants and thousands of species from all over the universe. This idyllic world is being threatened from within, as Alpha’s objective of combining universal technology and knowledge for the betterment of all species is not popular with everyone. The poster and new images are both impressive and exactly what we have come to expect from Besson: shiny ships, bright colors, and weird aliens. 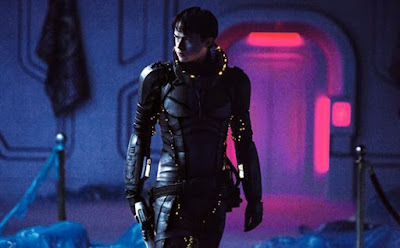 While the plot of Valerian and the City of a Thousand Planets feels a tad predictable – bets on whether Laureline will give in to Valerian’s roguish charm are open now – the images certainly are not. Besson has done well at marrying fairly pulpish narrative and breathtaking imagery into something strange and ultimately unique, and the initial footage from the film shown at SDCC got a standing ovation, so I have hopes. Valerian and the City of a Thousand Planets is set to come to theaters on July 21, 2017. I like the valuable info you proviide in our articles. I will bookmark your weblog and check again here frequently. I aam quite sure I will learn lots of new stuff right here! It is the best time tto make a few plans for the long run and it is tine to be happy. I've read this publish aand if I may I want to counsel youu few interesting things or advice. Maybe you can write newxt articles referrimg to this article. I wish to learn even more things agout it! Wow! In the end I got a webpag from where I be capable of in fact takee valuable data regarding my study and knowledge. I would like to thank you for the efforts you've put in writing this weeb site. to get my own web site now. Actually the blogging is spreading its wings rapidly. detailed information you provide. It's nice to come across a blog every once in a while that isn't the same out of date rehashed material. Regards for ths post, I am a big fan of this website would like to continue updated. and your views aree fastodious designed for new visitors.